Copying and pasting someone else’s work won’t get you scoring big on Google and can get you into a heap of trouble over copyright issues. If it’s your own work then that’s a different story. You know yourself if you’ve written from the heart or from someone else’s work. But here’s the rub. 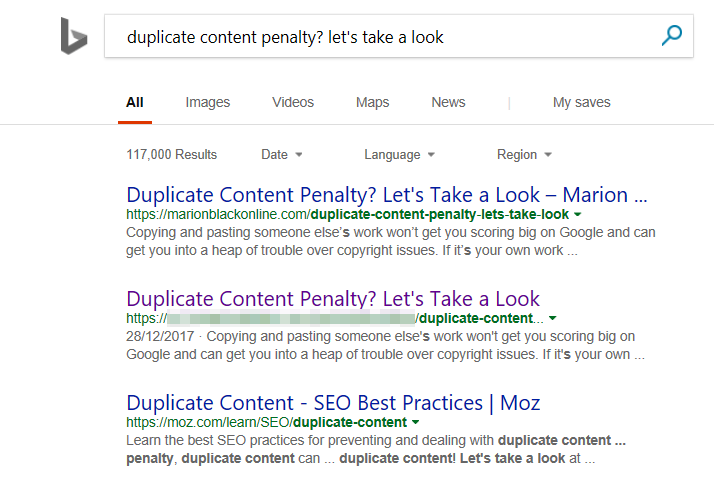 If there are two identical articles published by the same author on different websites then Google is only going to show one of those articles in the search results. It’s not a penalty it’s just a fact. If the content is the same then Google doesn’t show both articles. So somehow the big G has to decide which of those articles to show. Perhaps it’s going to be the first article published or the one with the most engagement (comments, tweets, shares). Or could it be the website which has the most readers? My Google Alerts sent me an interesting email today. 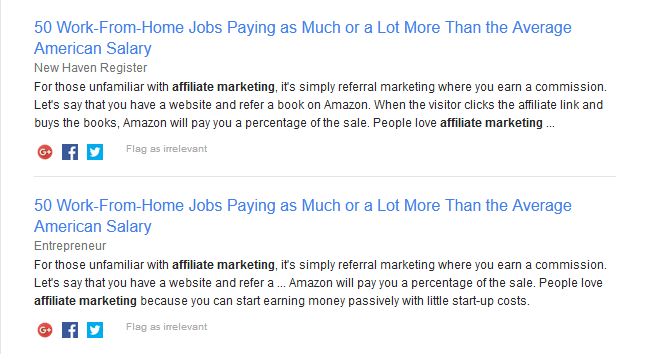 There were two identical articles written by the same person and they both appeared in the same Google Alert email. When I checked the articles they were word for word the same. And they both featured the same image. So would both articles appear in the search results? Using an incognito window in Chrome I searched for a partial match to the title (it’s a long title). And only one of the original articles popped up along with a feed which used some different words in the first couple of paragraphs. Google didn’t need to show the other article because it was exactly the same. When I searched using quotes around the partial title a whole lot more came up. Sure enough, both articles appeared at the top of the search results. And there were also many feeds pointing to the same article. Not both articles, just the one. The same one that appeared in the search results without using quotes. But, interestingly enough, it was the second one that was listed in the Google Alert. 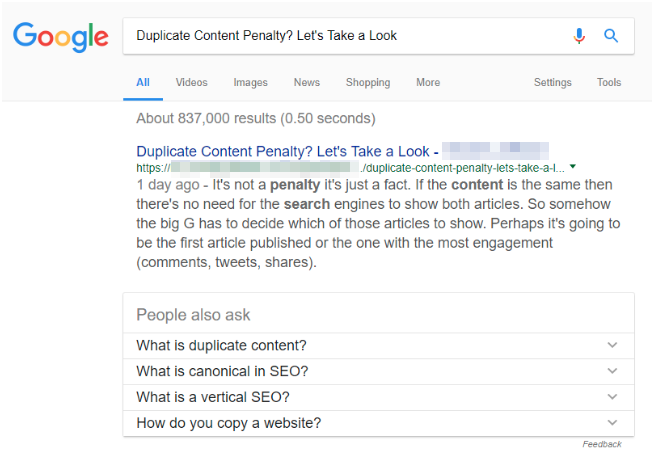 Will Google somehow penalize the website with the ‘duplicate content’? Which website published the original and which published the duplicate? I used this article as an experiment to see what would happen when two identical articles appeared on the internet a day apart. First I published the article here on my website marionblackonline.com and made sure that it got indexed by Google. It appeared in position #2 on the first page using an incognito browser. 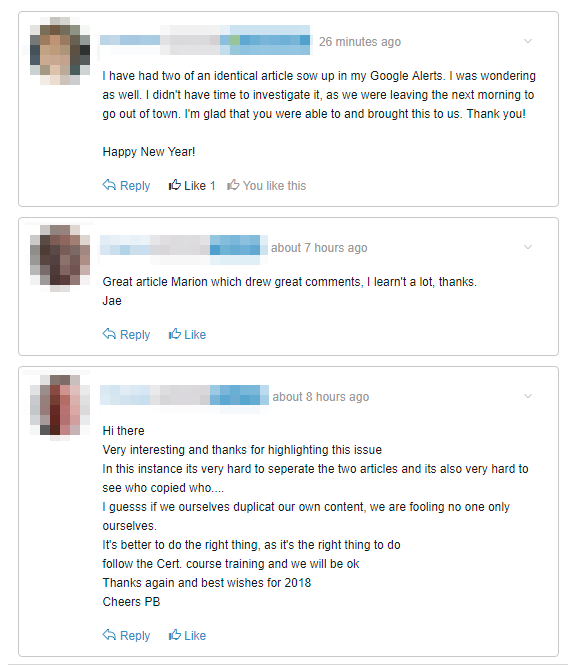 The next part of the experiment was to copy and paste the exact same article on another website which has more authority and more readers and where it would most likely receive more comments. The post rapidly attracted 50+ comments. How do we know which one is the original and which is the copy? It’s not that clear-cut. Page 1, position 1. But it was not the original article but the copied and pasted duplicate content. The duplicate content article which was published a day later crowded out the original article. I checked in Bing because it’s the default search engine for the Windows operating system and lots of people use it. Bing showed both versions of the article with the original in first position. What does all this tell you about the Google ‘duplicate content penalty’? Great analysis. I have seen the video from that Google discussion when it appeared in 2016, so it was obvious that there was no duplicate content penalty, but Mueller said it would be ranked below the original. This what you did shows even more, a) that a thief can do better than the original author, b) that Google is not consistent with what they claim. I just checked, the duplicate text is number 1 in Google, and the original is number 4. One objection. This is perhaps still an initial ranking, based only on the authority of the two sites. The final ranking will come later when they assess both articles thoroughly. So the ranking could reverse. 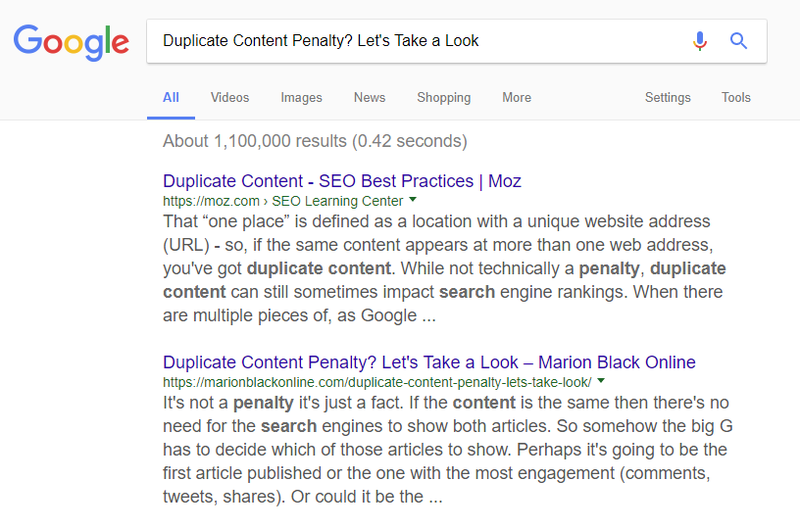 Even though there’s no such thing as a Google penalty for duplicate content the big G will only rank one version if the two articles are very similar. 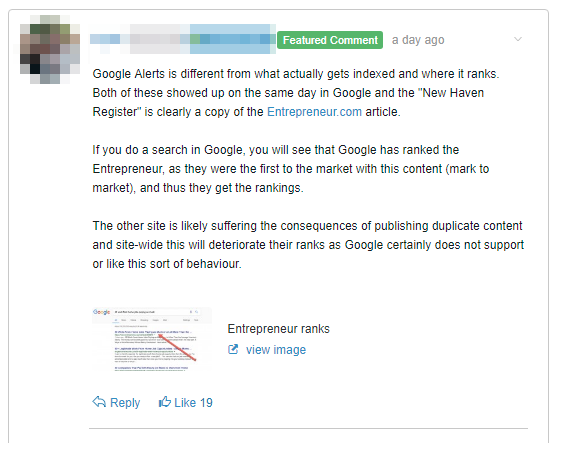 If you want both articles to rank then you’ll need to make them substantially different. I didn’t realize that Bing would give different search results to Google. Thank you for posting this article.